For a Sharp MX-M266N price quote fill out a quick quote form. I will have pricing to you within a few hours. Hey, if you’re in Houston, TX we can probably even deliver one or two of these to your office TODAY or TOMORROW! Scroll to the bottom of this post to view the brochure. Sharp has introduced their new compact, reliable, smart monochrome multi-functional printer. 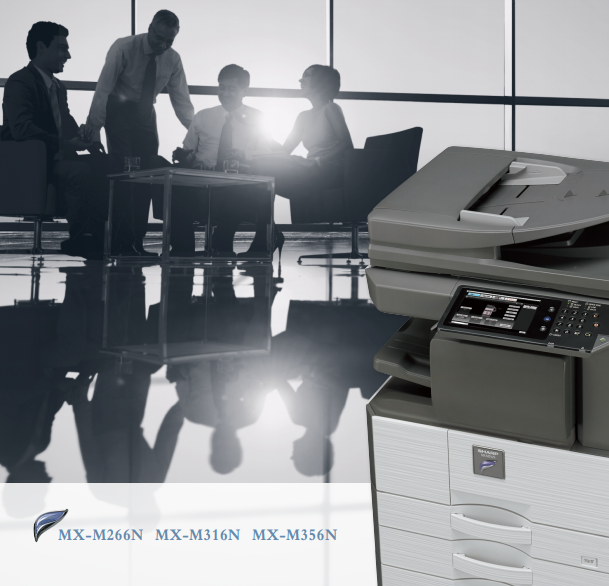 The Sharp MX-M266N, MX-M316N, MX-M356N is the best copier for a small work group who has no use for color printing. The print speed is impressive for the small footprint of the machine. At 26, 31, and 35 pages per minute you won’t be waiting long for your printouts. From a standstill the first print comes out of the machine in 7 seconds. This is the fastest “first print out” time on the market. This the predecessor to a top-rated copier, and it’s only been improved upon. The paper path is very short, with few moving parts. Fewer moving parts results in fewer misfeeds or jams, which leads to more productivity. Boasting wonderful standard features such as network printing, network color scanning, a 7 inch color hi-res touch screen display(pictured below), and digital offset sorting, there isn’t much else you really need. If you do a lot of stapling in your office you can add an internal stapling/offset sorting finisher that won’t add to the footprint of the machine. If you have Mac/Apple computers in your environment you can add post script printing as a cheap option. This will also enable you to print from your smart phone using the free Sharpdesk Mobile app from iPhone or Android. For TRUE mobile printing Skelton utilizes Drivve Print. This is a software platform that allows printing to our Sharp devices from literally any device capable of sending an email, from ANYWHERE in the world, in virtually EVERY file format. Data security is no concern with this system. It comes standard with 256-bit data encryption, and a convenient end-of-lease feature that wipes the machine clean of all internal data. There is a reason why Sharp is the leading copier manufacturer when it comes to security. We understand it’s one of the most important features of the modern office. If you have any questions about the Sharp MX-M266N price wise, or the MX-M316N, MX-M356N, call 281-351-5128 or shoot us an email. Stay connected with Skelton Business Equipment’s social media by visiting our Facebook page, @SkeltonBusiness, or Google+ page. 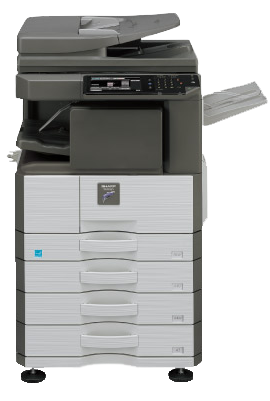 I would like a price quote on the Sharp MX-M266N copier with stand. Bill, please send me an email with your contact information and I will get you a price quote. Please include your zip code.